It’s roughly a month into the 2016-17 OHL season, and some of the league’s top players are off to hot starts. Traditionally viewed as one of the best development leagues on a player’s path to the NHL, the OHL continues to produce some of the top prospects in the world. Despite the departure of captain Dylan Strome, the defending regular-season champion Erie Otters sit atop their division once again thanks to a +20 goal differential that’s the best in the OHL. The London Knights and Niagara IceDogs, last year’s OHL championship matchup, are headed in different directions thanks to some key graduations, with the Knights one point behind their division leader and the IceDogs floundering in last place. A recurring theme amongst the league’s top teams is a balance of star overage prospects and rising young star talent. The Otters have been propelled to the second-best goal total in the league on the backs of contributions from veterans such as Alex DeBrincat and Taylor Raddysh, but 2017 prospect Ivan Lodnia quietly has produced 12 points in 11 games. Here are some of the OHL’s hottest players through the first month of the season. As of Oct. 28, Taylor Raddysh sits atop the OHL leaderboard in points, despite playing in just 11 games for the Erie Otters. Raddysh is coming off two consecutive 20-goal seasons, culminating in a 73-point effort last season that saw him get drafted late in the second round of the NHL Draft by the Tampa Bay Lightning. With the departure of Dylan Strome, Raddysh was expected to be one of the leaders of a younger and more inexperienced Otters team. After being cut from Tampa bay’s roster during the preseason, Raddysh came back to Erie a man possessed, racking up three goals and 10 points in his first four games. A big-bodied winger, Raddysh has fantastic playmaking abilities and has all the tools to continue to develop into one of the OHL’s best players. The Lightning have built their franchise into one of the NHL’s best by consistently unearthing great players outside the first round of the NHL Draft, and Raddysh could become a big part of their future if he can continue to rack up numbers like he has shown early on in the year. It’d be tough to mention the hot start to the year Raddysh has enjoyed without taking note of his linemate, Alex DeBrincat. DeBrincat was probably a name more well-known to hockey fans when they were drafted last season, as he racked up back-to-back 50-goal seasons in the OHL. Questions about his production being merely a result of his uber-talented linemates and his diminutive size hurt his draft stock, and DeBrincat inexplicably fell to the second round. He’s back with the Otters for his overage season, and it appears he’s on a mission to prove his doubters wrong early in the season. While DeBrincat has taken part in just nine games, he’s already tied for the league lead with an impressive total of 12. Not only were the Blackhawks able to grab Debrincat’s insane skill level at a bargain price, but DeBrincat’s hot start is a promising sign that he’s closer to being ready for the NHL than most people thought. He’s still got some areas in his game that could stand to improve, but DeBrincat’s pure scoring ability will be a godsend to a Chicago team constantly searching for secondary scoring. 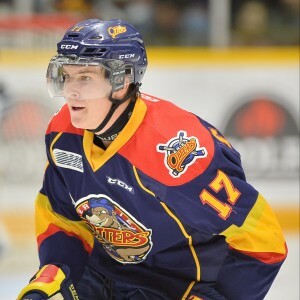 Despite being the second overall pick in the 2014 OHL Draft, questions about Mascherin’s frame and defensive abilities dropped him all the way to the second round of the 2016 NHL Draft. The Florida Panthers shocked some by rolling the dice on Mascherin’s scoring ability with the 38th overall selection, but the early returns on the Kitchener Rangers’ star have put to rest any questions about his long-term potential. 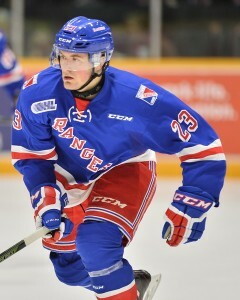 Mascherin, armed with one of the most intimidating shots in all of major junior hockey, has taken on a leadership role with the contending Rangers and leads them early on with seven goals and 23 points in his first 11 games. Playing alongside Toronto Maple Leafs prospect Jeremy Bracco, Mascherin has helped the Rangers to eight wins in their first 12 games, and they look primed to improve on their second-round playoff exit from last year. Mascherin isn’t the biggest player on the ice, but his abilities with the puck rival those of many first-round picks from this summer. After putting up 35 goals and 81 points last season, the Rangers are again one of the OHL’s top teams and Mascherin could be a top-five scorer in the league this year. 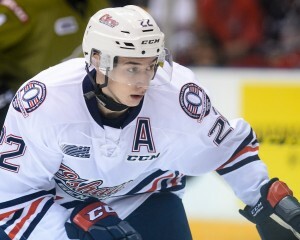 A prospect who truly came from out of nowhere, Cirelli went from OHL undrafted free agent to Memorial Cup champion in the span of a year, earning himself a selection in the third round of the 2015 NHL Draft. Perhaps no prospect in the OHL has improved as much as Cirelli has in the past two seasons, as the captain of the Oshawa Generals is now a good candidate to be one of Team Canada’s leaders at the 2017 World Junior Championships. After putting up just 36 points as an OHL rookie, Cirelli showed rapid improvement with 59 points in 62 games last season, despite playing for a weakened Generals team that barely squeaked into the playoffs. Through the early part of the 2016-17 season, Cirelli appears to have taken another large step forward, as he’s already racked up nine goals and 18 points in his first 10 games. Cirelli seemed to be somewhat of a lottery ticket when he was picked by the Tampa Bay Lightning, the speedy centre has proved his rise to prominence was no fluke. Expected to play a pivotal role in getting the Generals back to the playoffs, Cirelli could prove to be NHL-ready sooner than expected if he can continue his scoring form from early in the season. Owen Tippett struggled through an up-and-down rookie campaign last season, scoring 15 goals but adding just five assists while buried in a bottom-six role for the Mississauga Steelheads. However, the talented scorer proved in international play that he’s a candidate to go in the first round of the 2017 NHL Draft. Over the summer, Tippett was selected to participate for Team Canada in the Ivan Hlinka tournament. Despite failing to medal for the first time since 2007, Tippett contributed a goal and an assist for the Canadians. Coming into the season, Tippett, the fourth overall pick in the 2015 OHL Draft, was expected to help the up-and-coming Steelheads improve upon their first-round playoff exit in 2016. Early on, it appears he’s delivered on his massive potential, as he’s curently tied for the OHL lead in goals with 12 goals in just 12 games played. In addition, he’s also matched his assist total from last season despite playing in 36 fewer games. The Steelheads have a trio of highly touted NHL prospects in Michael McLeod, Nathan Bastian, and Sean Day, but it’s Tippett that’s leading Mississauga in points and has kept the Steelheads afloat despite slow starts for the team’s biggest stars. Tippett is one of the most dangerous goal-scorers available for next summer’s draft, and he could rise up draft boards in a hurry if he can continue his torrid scoring pace.